To sign up for any of the opportunities listed below, click here. Bridge Builders will develop unique connections with each other through communication and team building activities. The EDJ CHANGE cohort has created a website made by youth to connect all youth throughout Memphis with resources and opportunities. We need your input to ensure that the website is beneficial to all youth. 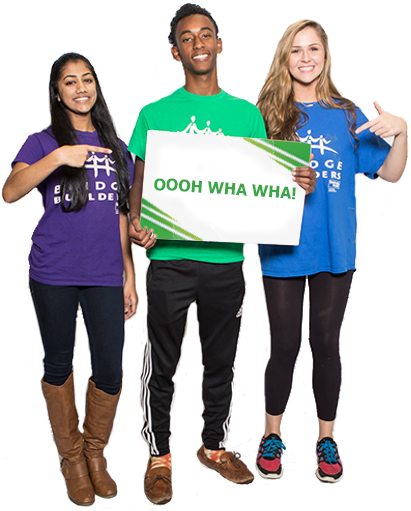 Join us for a fun, interactive focus group led by your fellow Bridge Builders. NOTE: Please bring a laptop if you can. 60 spots available. Come join the Gender and Sexuality (GAS) Cohort on April 6th from 1:30-3:00 pm to celebrate the marking of BRIDGES, USA as the first Brave, Safe, and Educated (BSE) space for LGBTQ+ youth in Memphis. This organization has met a list of criteria that will ensure that everyone feels brave enough to be themselves, safe in their identities, and educated on the LGBTQ+ community! This event will include a scavenger hunt, games, and more – you won’t want to miss it! 30 spots available. The Rappelling workshop will include supervision and instruction by professional staff on the BRIDGES outdoor High Ropes Course. Participants will have an opportunity to rappel, using ropes and harnesses, off the side of BRIDGES using techniques taught by the staff. Participants will also have an opportunity to climb the rock wall throughout the workshop. We require participants to wear closed toed shoes and clothing that allows you to move around freely. 30 spots available. At the Cloud901 Teen Lab students will work through several projects that they will create with the electronic platform arduino board. 20 spots available. Consent101 is an educational workshop which will delve into the general definition of consent and consent in specific situations and examples. We will explore other questions including what consent looks like, how one receives consent, and how consent works. IMPORTANT NOTE: There will be a videographer from the Associated Press on had to collect video snippets of this workshop, so please be aware that you may be recorded while in attendance. 30 spots available. Come hear from 4th, 5th, and 6th graders from St. Patrick Catholic School as they share their experiences making a digital film of their stories. Families are welcome to attend. 25 spots available. Come participate in a poetry writing workshop in the Cloud901 Teen Lab! 25 spots available. Students will work on Kinex Bridge Building in the Cloud901 Teen Lab. 25 spots available. Members of the Rhodes Admission Office will provide guidance on selective college admission, including tips on essay writing, interviewing, and leveraging your experiences to find the right college for you. 35 spots available. Are you interested in learning more about secondhand smoke and smoke-free environments? Are you interested in public health advocacy and want to increase your education about the harms of tobacco to help make a difference in your community? If you answered yes to these questions, join the Shelby County Health Department for an interactive educational training designed to enhance youth knowledge about the issue of secondhand smoke and smoke-free environments! 50 spots available. Marcin Arendt will discuss how music was used as a beacon of light during one of history’s darkest times, WWII. He will perform music on a violin from a concentration camp where a family member was imprisoned. 20 spots available. Join Rhodes’ Muslim Student Association to break down stereotypes about Islam and join MIFA’s annual neighborhood cleanup. 20 spots available. LUNCH PROVIDED. Are you interested in leading change in Memphis on an issue that you are passionate about? Participate in this workshop where you will learn what it takes to start your own non-profit or campaign! The workshop will also be a competition. 30 spots available. FHAO Student Leaders will facilitate group discussions focusing on the Freedom Riders’ choice to use nonviolent direct action as a tool for social change. Participants will assess non-violent direct action strategies and discuss what it means to achieve justice. 50 spots available. Come learn about the work Revolutions CoOp is doing to increase access to bicycles and help spruce up their garden! Students must wear closed-toe shoes and clothes that can get dirty. 30 spots available.